Did you know that Chappies Bubblegum is South African? I did not and am beaming with pride at this latest discovery. For those of you who have no idea what Chappies bubblegum is, let me explain why they are special.Â Chappies are plain old bubble gums (thatÂ were, and still are,Â very cheap ).Â What made them different was that ‘Did you know?’ facts were printed on the reverse side of the wrappers.Â ItÂ was full of quirky information. 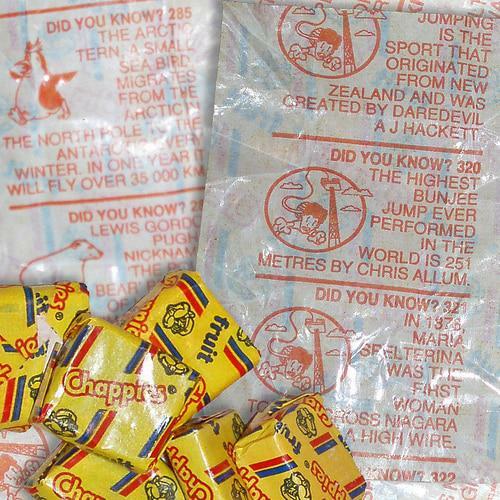 An especiallyÂ fond Chappies memory of mine is going on long family car trips, stopping at a cafe and buying a handful of Chappies.Â One by one we each unwrapped our Chappie and read out ourÂ ‘Did you know’s?’. Oneundonly wrote an interestingÂ postÂ on Chappies earlier this week and asked if Chappies were not our form of internet back then? Today our ‘Did you know?’ is Google. It is also better becuase you can find out what you most want to know. It is specific and tailored for you. Chappies was simple fun :Â Google is now a simple necessity. We Google what we want to knowÂ and more than often, do not read anything that is not directly linked to what we are either interested in or want to know. We do not have time to read just anything these days. I think this is sadÂ – where did the simple pleasures of reading and knowing odd things go? Do not get me wrong, we know a lot today but is it still fun knowing? Chappies made the process of learningÂ fun. It made having a Chappies bubblegum an experience that is treasured.Â This is innovative and clever marketing that worked and one of the few scenarios where both the brand/company and buyer benefited. This entry was posted in Blog and tagged Bubblegum, chappies bubblegum Suth African marketing, chewing gum, did you know, experience, facts, fun, google, infomation, innovative marketing, knowing, learning, memories, reading, wrapper. Yes, great post Wendren and I read the post about this bubblegum at ” Oneandonly” too. Thanks, thats a nice follow up.